The first thing we notice about this chart is that one could argue that COMPQ has been in a secular bull market since 2002 -- except that's all that's visible on this chart, because one could actually argue on a longer-term chart that COMPQ has been in a secular bull for decades longer than that. But since there would inevitably be debate over the tech crash and whether that ended the secular bull, we'll set that argument aside and start this bull in 2002. 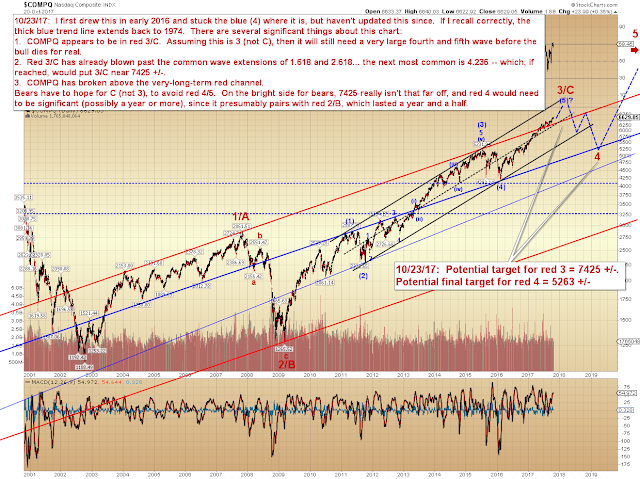 That would make the 2008 crash part of a cyclical bear within the confines of a secular bull. If this bull market is to develop into a five-wave move (as it should), then the next bear market (red 4) will pair with the 2007-09 bear, and will likewise be a cyclical bear within a secular bull. 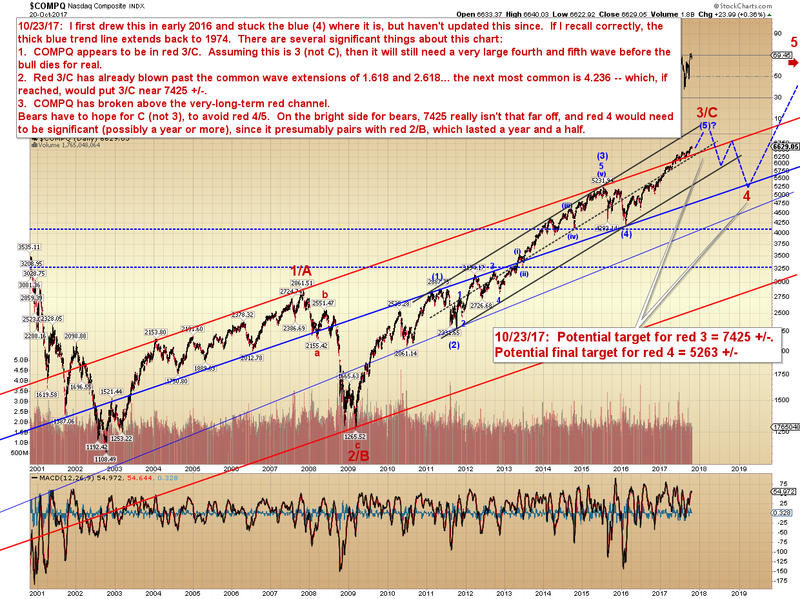 The bull would then resume to form the final large fifth wave, which would pair with the 2002-2007 red 1/A -- meaning the pending fifth wave could last about 5 years. But that rally, while significant and likely strong, would truly be a "last hurrah" -- to be followed by a true secular bear market that could last many years - potentially decades. This may fit the demographics, and may likewise fit the "time to pay the piper" argument that bears have been making for a long time regarding the Federal Reserve's Keynesian boom/bust cycles. Those of us who started trading sometime after 1982 haven't seen a true secular bear market. We've only seen cyclical bears, which end in V-bottoms -- because investors still think stocks are going back up. Secular bear markets end not with V-bottoms, but with indifference. 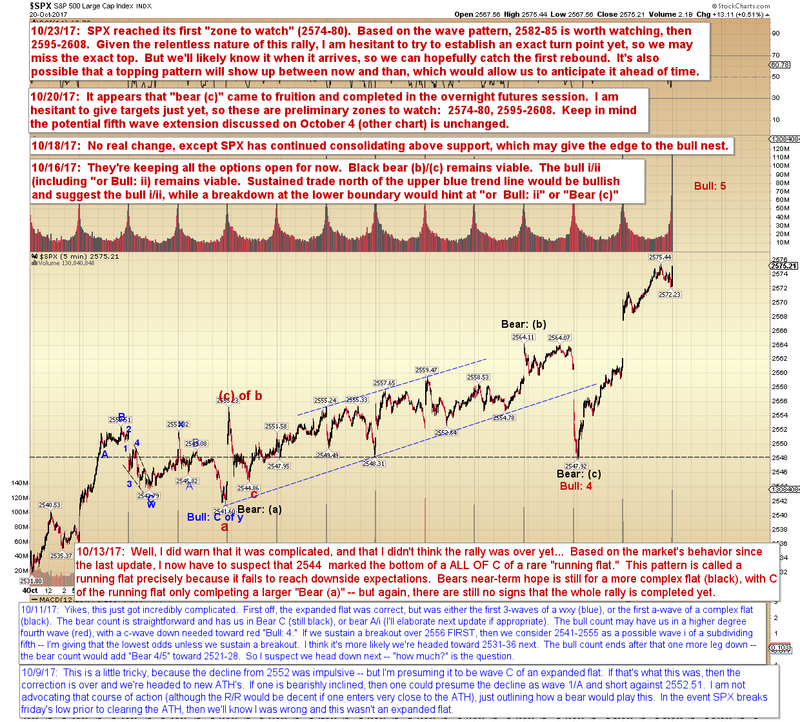 Secular bears kill off the first wave of investors who buy the dips. They kill off the second wave, too, and often beyond. By the time a secular bear market ends, nobody even wants to own stocks anymore. Secular bears are generational bear markets. If all of the above is correct, we can establish a tentative time frame of 2023-25 to mark the potential end of the long-term bull market -- and possibly the beginning of a truly long-term bear market. In the meantime, we're not quite there yet, and this wave seems to have at least a bit farther to run before we finally see at least a decent tradeable correction. 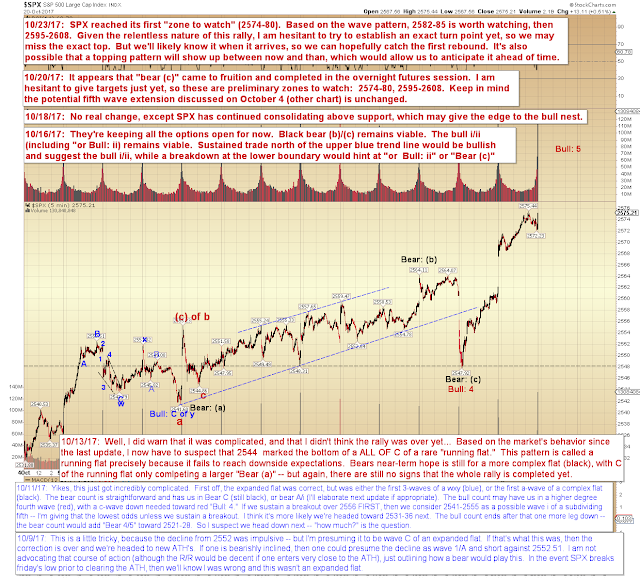 In conclusion, it appears increasingly likely that the next top will be a "big one," so there's no need to front-run and we can await clear signals. For now, the market still looks pointed at least a little bit higher, and that's all we really need to know -- although we should keep in mind that it's now at least technically possible for bull 5 to complete on the next new high. Trade safe.